Shiny Salamence in game: 107 Who? Important notice! Pokemon Shiny Salamence is a fictional character of humans. 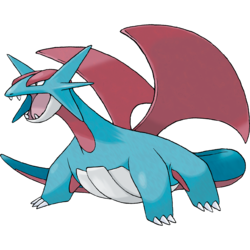 Salamence is a quadruped, draconic Pokémon with a long, tapering tail. It is primarily blue with a gray lower jaw and thickly scaled underside. There are red markings on its throat, the underside of its tail, and stripes on the inner surface of its legs. Additionally, there are raised red ridges above its eyes. Three flat fins protrude from either side of its head, possibly acting in the same manner that a Canard would on an aircraft. It has two pairs of pointed teeth, one in the upper jaw and one in the lower. Each of its short legs has three claws. This Pokémon’s powerful desire to fly triggered a mutation that allowed it to grow large, red wings. As an expression of joy, it flies around and releases blasts of fire. If enraged, it loses all sense of self and flies into an uncontrollable rampage, destroying everything around it until it tires itself out. This Pokémon is found living in rough terrain. As a result of its Mega Evolution, Salamence becomes even more brutal than ever before, to the point where it is liable to turn against the Trainer who raised it. 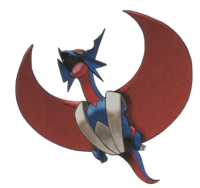 Because of this, Mega Salamence is feared as "the blood-soaked crescent". 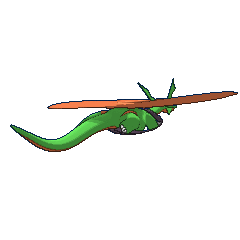 Anything and anyone in Salamence's path gets sliced in two by its bladelike wings, posing no interruption to its flight. 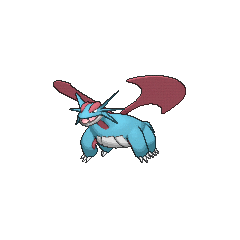 A Salamence belonging to J first appeared in Mutiny in the Bounty. Salamence was first seen in the 6th Pokémon movie Jirachi: Wish Maker. Butler used it against a wild Flygon that was helping to free Jirachi from him. It reappeared as a cameo in Destiny Deoxys. Silver used his Salamence to battle Moltres in The Search for the Legend. Drake of the Elite Four used a Salamence in Vanity Affair against Team Rocket after they tried to steal Ash's Pikachu. 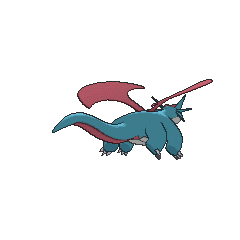 A Salamence appeared in The Clumsy Crier Quiets the Chaos!, in which it went on rampage. A Salamence appeared in A Riveting Rivalry!, under the ownership of Sawyer, where it was revealed to have evolved from a Shelgon sometime before the episode. 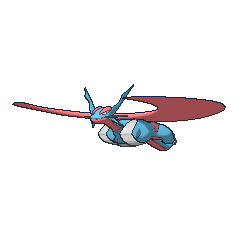 A Salamence that can Mega Evolve appeared in Volcanion and the Mechanical Marvel, under the control of Levi and Cherie's Mega Wave. Salamence's first anime appearance was in a fantasy in Let Bagons be Bagons. Team Rocket found a Salamence in some underground ruins when they were searching for Ho-Oh in Battling the Enemy Within. A Salamence under the ownership of a Coordinator competing in the Kanto Grand Festival appeared in May, We Harley Drew'd Ya!. Another Salamence appeared in a fantasy in Pinch Healing!. A Salamence appeared in the opening scenes of Giratina and the Sky Warrior and Zoroark: Master of Illusions. A Salamence that can Mega Evolve into Mega Salamence appeared in Mega Evolution Special II. A Salamence appeared during a flashback in The Redemption as one of the many Pokémon fighting in the great war of Kalos, 3000 years previously. When Ruby was a child, he battled a Salamence that attacked him and Sapphire while the two were playing outside. 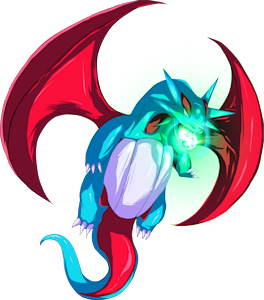 After being defeated by Ruby and having scarred his forehead with its Dragon Claw in the process, the Salamence went on a rampage and destroyed a lab, freeing Rayquaza, which was in captivity at that time, in the process. This resulted in Norman being banned from the Gym Leader test for five years. This encounter changed both Ruby and Sapphire and their views on Pokémon, as well as themselves. In Ruby's case, he felt he was too strong, and in order to keep himself back, he focused on Pokémon Contests. Sapphire, on the other hand, felt weak after the encounter and decided she had to become stronger, and spent much of her time in the wild honing her battle skills. In the Omega Ruby & Alpha Sapphire chapter, Zinnia reveals that her Salamence is the very same one that Ruby fought in his childhood. Zinnia had ordered Salamence to free Rayquaza from being experimented upon by the Pokémon Association. Salamence faces Ruby again in the Sky Pillar, along with his companion Latios, and is Mega Evolved during the battle, but still loses. Years later, in the Emerald chapter, Dome Ace Tucker is shown to be in possession of another Salamence, with which he defeats Sapphire. While Sapphire acknowledges the man's overwhelming skill, she also adds that such a Pokémon is a hard one to fight against with her phobic old experience many years back. 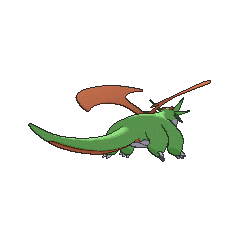 In PAORAS04, a Salamence appeared silhouetted in Steven's explanation about the Draconid people. Clears one kind of Pokémon with the same type as Mega Salemence (max 10). Salamence shares its category with Horsea, Dratini, their evolutions, and Goodra. They are all known as Dragon Pokémon. 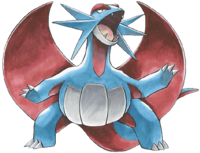 Salamence appears to be based on a salamander, most likely the Hida salamander or Anderson's Salamander combined with the archetypal fire-breathing European dragon. 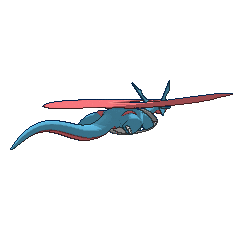 This is further backed up by Salamence featuring three prominent finlets on either side of its head, which can be interpreted as external gills. These external gills are typical for many species of amphibians.